news Australia’s number two telco Optus reported a net profit of A$177 million for the third quarter, representing growth of 4 percent, according to a Singtel Group news release yesterday. The company’s operating revenue was up 2 percent to A$2.42 billion, while EBITDA increased 2 percent to A$562 million. “Optus delivered another quarter of revenue and EBITDA growth, adding 182,000 mobile customers, in spite of the intensely competitive Australian telecommunications market. Optus continued to lead the market with new, relevant and personalised digital services while making improvements in customer experience,” said Optus Chief Executive Paul O’Sullivan in the press release. In the mobile sector, total revenue rose 4 percent to A$1.62 billion with service revenue growth of 2 per cent. EBITDA rose 3 percent from increased service revenue and lower customer acquisition costs associated with the introduction of new postpaid price plans during the quarter. Incoming service revenue grew at 18 percent with customer growth and increase in SMS and voice revenue. The total mobile customers grew by 182,000 to 9.41 million with a net addition of 113,000 postpaid customers and 69,000 prepaid customers during the quarter. The number of 3G customers grew to 6.24 million which is a 5 percent increase from the previous quarter. This included a base of 1.55 million wireless broadband customers, an increase of approximately 94,000 customers. The news release claims that Optus continues to lead the market with differentiated digital services which provide customers with personalised applications and content. After Smart Safe, Optus TV Now and Go Places, Optus has now introduced another unique TV and Video application that is for the exclusive streaming of the Australian Open 2012. 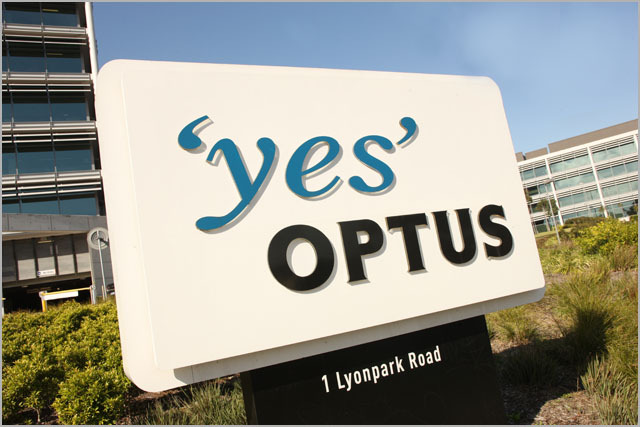 Optus has commenced the rollout of Long Term Evolution (LTE) on the Optus Open Network and successfully connected Australia’s first LTE data call in the 700MHz ‘Digital Dividend’ spectrum band on 1 November 2011. From April 2012, Optus will deliver its first LTE services to Newcastle, Port Stephens, the Hunter Valley and Lake Macquarie areas. A capital city service rollout will begin in the second half of 2012 with phase one to deliver LTE services in Sydney, Melbourne and Perth, and phase two to other capital cities. In the Business and Wholesale fixed sector, overall revenue and EBITDA were reported to be stable. Satellite and ICT and managed services revenue showed growth, while voice and data and IP revenue declined by 3 percent as growth in Optus Evolve services was offset by the accelerated exit of legacy data products. ICT and managed services grew 10 per cent due to an increase in managed services revenue from prior corporate wins. Wholesale fixed revenue grew 2 percent while total voice revenue was stable. Data and IP declined by 4 percent due to the exit of unprofitable off-net services. Satellite revenue increased 10 percent mainly due to revenue from the new NBN Interim Satellite Service contract. In this quarter, Optus secured a multi-million dollar multi-year contract to continue to provide state-of-the-art satellite services to GlobeCast Australia, including the provision of direct-to-home broadcast services on its D2 satellite. In the Consumer fixed business, Optus continued the exit of its fixed resale business. On-net revenue declined 5 percent due to lower on-net broadband ARPU from increased data inclusions. EBITDA decreased one per cent with lower revenue although EBITDA margin improved slightly. On-net broadband customers totalled 965,000 as on 31 December 2011. During the third quarter, Optus disclosed details of various consumer NBN packages. Future plans include provision of enriched digital offerings such as the new Optus MeTV service that provides customers with access to on-demand television programmes at affordable prices. Optus also announced a new online forum—My Optus Community—designed to enable Optus customers interact online, provide feedback and share experiences. It will include a dedicated small and medium business forum and will also allow customers submit concepts and ideas for potential products and services.